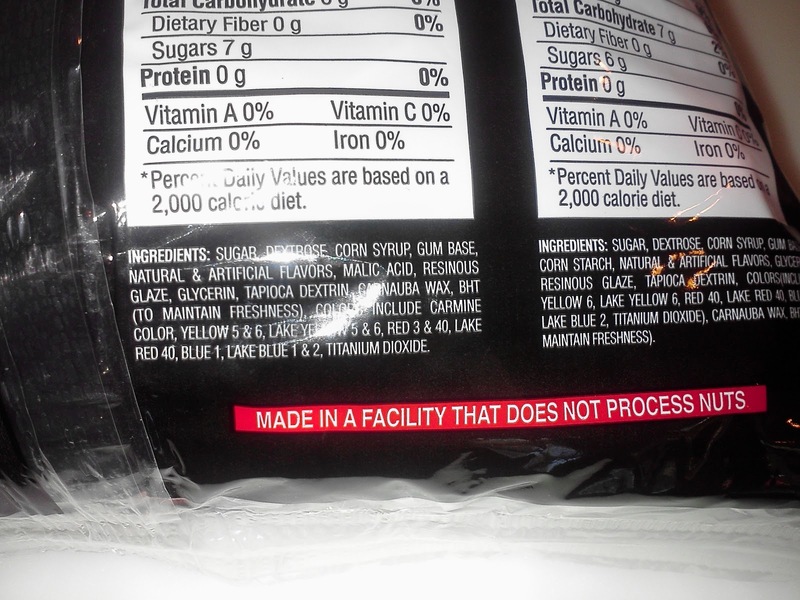 Tootsie Roll (R) candies are produced in a dedicated, nut-free facility. I got an e-mail from a parent last night who said she received a really nice note from Tootsie Roll industries. This mom had sent Tootsie Roll a thank-you note for being a candy that kids with peanut and tree nut allergies could safely enjoy. What a great idea, to let companies know why you appreciate their nut-free policies. I'm glad she shared her experience with me. This mom's e-mail also made me realize that a lot of people might not know that Tootsie Rolls are made in a dedicated nut-free facility. 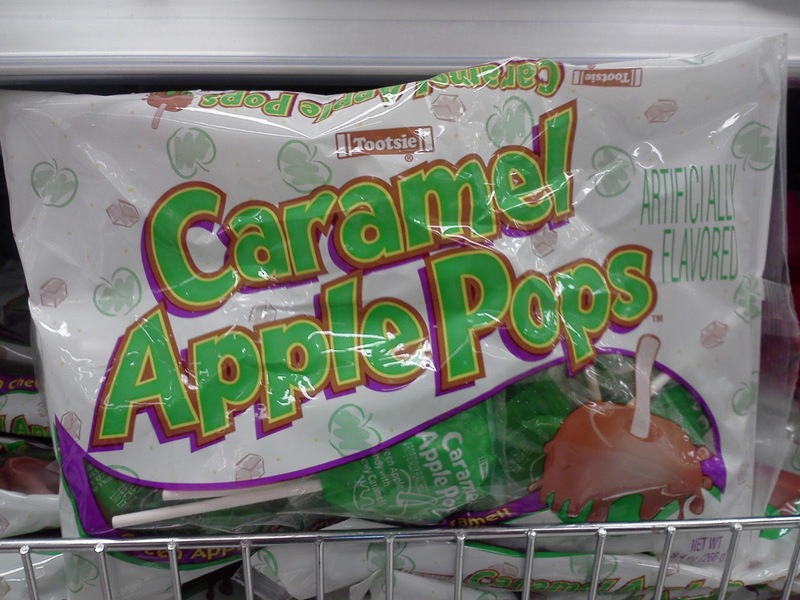 This is the case for their entire family of products, like Caramel Apples, Junior Mints, Tootsie Pops, Sugar Babies, Dubble Bubble gum, Andes Candies and many more. 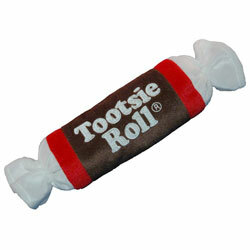 Click this link to see Tootsie Roll's entire family of products. If you are looking for a last-minute Halloween candy for your nut-allergic child (or for yourself), then Tootsie Roll brand candies are an option easily accessible in nearly every store. Caramel Apple Pops are just one of the products made by Tootsie in their nut-free facility. Do any of your products contain peanuts or nuts? At this time, all of our confections are completely peanut, tree nut and nut product free. We have no peanut or tree nut products in any of our facilities. At this time, all of our confections are gluten free with the exception of Andes cookies. We do not use wheat, barley, rye, oats, triticale, spelt or any of their components and that includes our dusting on our conveyor belts. We do use corn and soy products in the manufacturing of our products. Tootsie does not use wheat, barley, rye, oats, triticale, spelt, or any of their components, either as ingredients or as part of the manufacturing process. Corn and soy products are used during the manufacturing process. You can find Surf Sweets gummy candies (free of the top 8 food allergens and organic) including worms and spooky spiders at specialty grocers and Whole Foods; Skeeter Snacks cookies (peanut and tree nut-free) are available at many supermarkets and Costco; Yummy Earth lollipops (top 8 allergen free and organic) are available at many supermarkets and specialty grocers, even Toys R Us; Divvies nut-free, egg-free and dairy-free candies and treats are at specialty stores and Wegman's supermarkets. Time is running out to order from awesome online retailers and nut-free bakeries like Premium Chocolatiers, Sweet Alexis bakery, Nutphree's, Deans' Sweets (gourmet chocolates) Cakes for Occasions and Vermont Nut Free Chocolates! If you haven't ordered yet, check to see if you can still get a Halloween delivery. Many of these also have local storefronts, so see the links for more details. If you live in the area, you can always stop in! 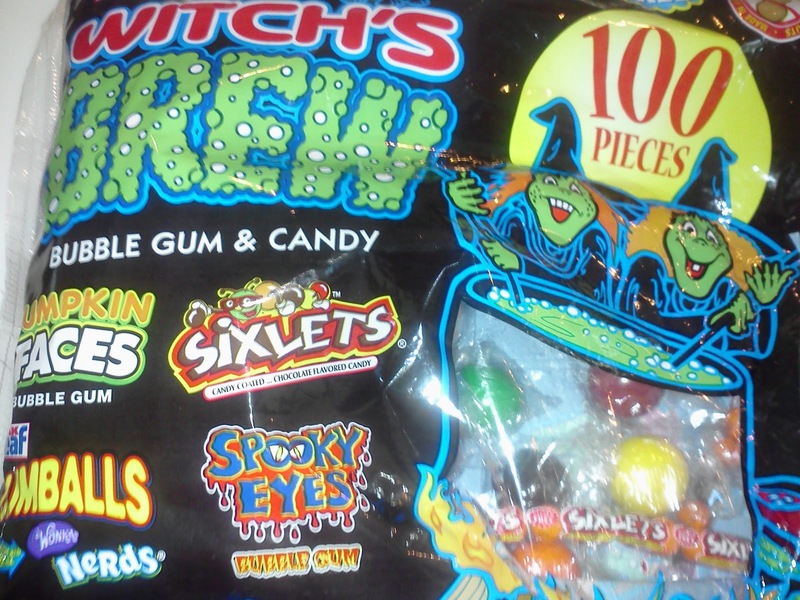 What are your favorite Halloween nut-free supermarket finds? By now all of us are in full swing of school, homework, extra-curricular activities and of course, Halloween preparation. With work of my own to do and two kids on the go, I like to have some healthy, tasty and relatively easy meals in my arsenal. This is a busy time of year, but we we've still got to eat dinner! So I thought I would repost one of my family's favorite week night meals: pasta with homemade sauce. Besides being fresher-tasting, a homemade sauce is a great food allergy-friendly option because we know exactly what goes into it. Plus, making pasta sauce can be very relaxing after a long day. Once the meat is cooked, you just let it simmer, stir it occasionally and let the great cooking smells fill the house. 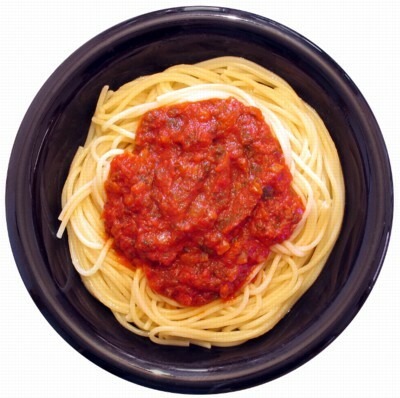 This sauce is wonderful to freeze and defrost on those super-busy nights. Occasionally, I make the sauce in the morning, put it in the slow cooker on low and then cook the pasta in the evening. The sauce--the hard part--is already completed and the flavor benefits from the long simmer in the slow cooker. If you're looking for a meal to fill little tummies before Trick or Treating (cutting down on candy temptation until you can either vet or turn in the candy for safe treats), may I suggest this? Here's my recipe for my favorite pasta sauce. The sauce has ground beef; if you want to go meatless, this recipe is still good. Or add some crumbled, cooked Italian sausage if you enjoy that flavor. As with any pasta sauce, the longer you simmer this, the better it gets. It's even better the next day. You can double the recipe for a larger family. Enjoy! Heat olive oil in pan and add beef. Season meat with black pepper and brown in a deep skillet over medium heat. Add garlic, crushed red pepper and oregano. While this is cooking, grate onion into meat mixture using a hand grater. Cook a few minutes to soften the onion, then add broth and wine or OJ. Stir pan and deglaze, incorporating any browned bits from bottom of pan. Add tomatoes and half the parsley and basil. Stir again, then reduce heat to low and simmer, stirring occasionally, for about 30 minutes. (You can do this while you boil water and cook pasta). Right before serving, sprinkle with rest of parsley and basil. Serve with your favorite pasta. Sprinkle with freshly grated Parmesan, if using. Kenton Duty of Disney's "Shake It Up" (if you have tweens in the house, you probably know this show) is a teen ambassador for FAAN who helped create a video that talks to kids about coping with food allergies. Click the image above and be sure to show this to your kids! Kenton does a great job of being matter-of-fact about food allergies and in discussing the ways he must cope with them. He talks about medication, communication with others, LISTENING TO YOUR PARENTS...woot! and more. He is so articulate and your kids probably already know him, so they can relate to him as a peer. At 17 years old, he is much cooler to listen to than we parents can be, at times. I know -- painful but true. One reason that I wanted to post this Kenton Duty video (incidentally, sent to me by Eleanor Garrow of FAAN, so thanks to her and FAAN for their outreach efforts) is because I know how many of us struggle with the emotional aspects of allergies as our kids come to terms with them. I was reminded of how painful it can be when a mom e-mailed me and asked for advice regarding her 8-year-old daughter who was struggling socially and feeling left out due to her food allergies. I'm sure all of our kids have had this experience at one time or another and it stinks. Sometimes people might feel like our kids are too fragile or too much trouble to have around. This hurts. We can't change our approach to food allergy safety because someone else might not like it, so occasionally a "friendship" might fizzle. I can tell you that the true friends stick around and I've been amazed at the level of compassion some children can have. I am not a psychologist, but I am an amateur one since I am parent. Just kidding, but you know that we get called upon to counsel our kids about so many things, including food allergies. I've found that it helps when we, the parent, don't get all excited and agitated with each incidence of unsafe food or a perception of being passed over for a party or activity. At least not in front of your child. In private, vent all you want! It also helps to commiserate with your child about the unfairness of not being able to eat a piece of birthday cake or having to turn in their Halloween candy, but try not to dwell on this with your kids. Validate them but be sure to show them how something else in their life is positive. Every child has something positive about themselves to celebrate. Are they a good dancer? A great soccer goalie? Do they tell funny jokes? Are they a good and loyal friend? Do they look out for their younger brother or sister? Do they have a great smile? I always told my daughter that food allergies are just one thing that make up who a person is, like having brown eyes. It's not everything. And the other thing that has helped is to tell her that everyone has some challenge in life. Even if you don't see it, it's there. "I spoke to my daughter (who is 12) about how she coped at your daughter's age and she gave me some insights. She told me that usually she had the "better" birthday treats and things whenever I sent her with her own food, so kids usually told her they wished they could have what she was having! That helped soften the blow of not getting to have the cake or whatever she couldn't eat. As you rightly point out, kids can have some struggles socially if they feel like they are being excluded because of allergies, so one way I helped to combat this was to make sure I offered my house as a play date haven whenever possible. This way, my daughter didn't feel left out as much and I could make sure things were safe. I also sent food to all of the school parties and the kids eventually got excited because they knew I would send something good! It is a lot of work on our end, no question, but I found that this did help my daughter in social situations. Our family has found that involving kids in managing their allergies will help make them more independent so that they can go to that party of sleepover because you know you can trust them to look out for themselves. My daughter told me that she found her confidence grew the more she learned that she had a role in managing her allergies and that she could live safely in her environment if she knew what to do. It is definitely not easy and I'm sure we missed a few parties because the conditions just weren't safe for my daughter. But as she has gotten older, my daughter has done so many things, even going with her friends to a restaurant (pre-approved, of course) without us. (That was a scary one for me, but she was fine). One other thing my daughter enjoyed is the FAAN newsletter for kids. If you are a member of FAAN, you can sign your daughter up for this awesome newsletter, featuring kids of all ages talking about how they deal positively with their allergies. 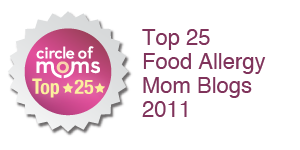 www.foodallergy.org will show you more about that, and I suggest it as it really shows kids they are not alone in this." I can't say enough about this FAAN kids' newsletter. You have to be a member to gain access, so if you aren't a member, yet another reason to become one! If you can find a support group with kids' activities, that is great too! A lot of the local support groups have family activities. FAAN's web site has a link with a list of support groups to help you find one. MOCHA is another good source of support group info. My e-book has some ideas for helping kids with food allergies cope. Click the link to learn more about how to get it. What has helped ease the burden for your child? What has helped, you, the parent? 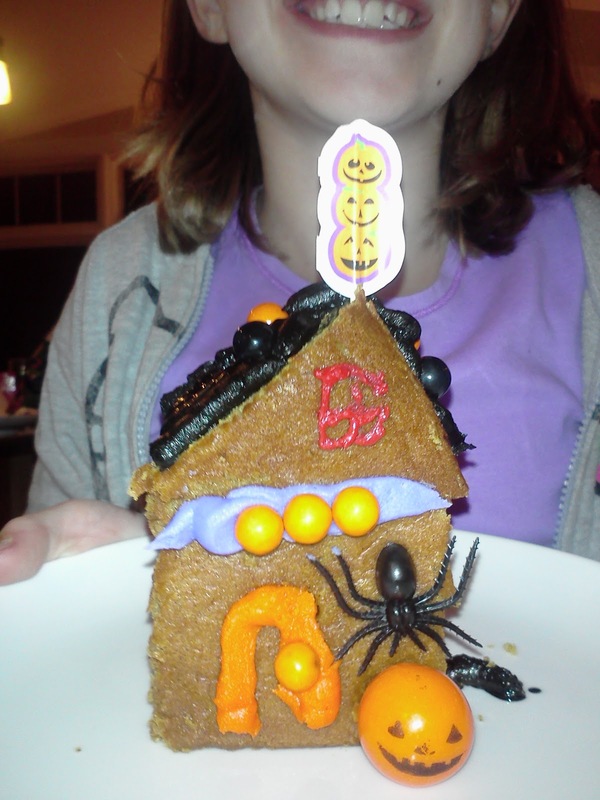 Nut-Free Halloween Edible Craft Project: Pumpkin Cake Haunted Houses! 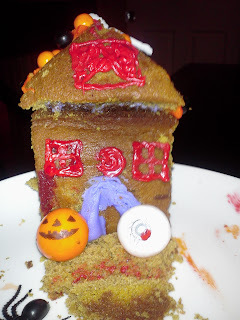 A completed pumpkin cake Haunted House. Halloween is fast-approaching and those of us who have kids with severe food allergies are searching for fun Halloween treats and activities that are safe. Here's one to do with your kids at home or for a Halloween party with friends: an edible Halloween craft project using delicious and healthy pumpkin cake to make "Haunted Halloween Houses." I recently included a pumpkin-apple bread recipe and please note that this recipe is a bit different. It's more dense, which helps the cake stay together. Another tip is to let the cake sit for several hours after coming out of the oven so that it does not fall apart when you try to work with it. To "glue" the roof of the Haunted House to the base and to create doors, etc., we used a basic buttercream frosting. I tinted the frosting purple, black and orange and then a reusable pastry tube with tips. (I have this kind of stuff because I am a kitchen gadget geek.) Nordic Ware has a wonderful pastry bag made out of solid plastic--it is kind of like a cookie press and is very easy to clean up. I bought mine at SuperTarget, my home away from home. If you don't have one of these frosting decorators, you can place the different frostings in resealable plastic bags, cut off the corner of the bag and then squeeze the frosting through it. Works great! My daughters used inedible plastic spiders as well as Sixlets, Halloween gumballs and cupcake picks (inedible) to decorate. We got this huge bag of nut-free candy made in Canada at my local Jewel (Albertson's) supermarket for some of our candy decor. 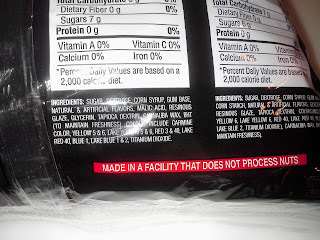 Candy made in facility that does not process nuts. orange Sixlet candies, among other nut-free treats. You could also use Surf Sweets spooky spiders, Vermont Nut-Free Chocolate Skippers (like M&Ms) and other chocolate props such as Premium Chocolatiers amazing array. Whatever you like and is nut-free (or free from) would work here. I just had a thought that a plain Tootsie Roll (nut-free facility, by the way) would make a nice little chimney on the house. In any case, you and your kids can have fun with this project. Preheat oven to 350 degrees F. Grease and flour a 9 x 9 inch square baking pan. In a medium bowl, combine dry ingredients and mix. In a small bowl, combine pumpkin puree, milk and vanilla. Set aside. 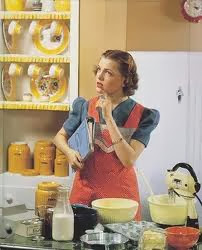 Cream butter or margarine with sugar in a large mixing bowl until fluffy and light. Beat in eggs or replacer; eggs should be added one at a time and then blended. Reduce mixer speed to low. Alternately, add flour mixture and pumpkin mixture, ending with flour mixture. Beat until just blended and no traces of flour remain visible. Pour batter into prepared pan. Bake for 35 minutes; check with wooden pick. If it the pick is clean, remove from oven. If not, bake a few more minutes and test again. Do not over bake. Cool in pan for 10 minutes, then remove to wire rack to cool completely. For this project, let it cool for several hours. If eating it without doing the project, eat a slice warm with some powdered sugar on top. Once the cake is cooled, slice it evenly into squares. Use one full square for the base of the house. Cut another square in half; these triangles will be used for the roof. Secure the roof to the base of the house with butter cream frosting of your choice. Decorate as desired and enjoy! You can keep the finished houses in a container with a tight-fitting lid for a few days...but they will probably disappear pretty quickly. 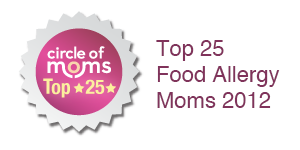 While you are online today, will you take a minute and vote for me in the Facebook Circle of Moms Food Allergy Blogger contest? It ends today, so every vote counts! If you like this blog, I'd love your vote. And THANK YOU! 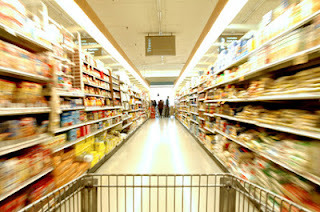 Zipping around to too many supermarkets in search of nut-free foods? Online resources might be the answer. Grocery shopping for a growing family takes up a fair amount of time, but shopping with specific food allergies in mind is even more time-consuming and often frustrating. Higher cost and limited accessibility to certain nut-free, gluten-free, dairy-free or other "free from" foods can result in multiple shopping trips that might leave you empty-handed. It's true that foods specifically created to accommodate food allergies and intolerance are becoming more common in U.S. grocery stores, but they are still not readily accessible in many cities. 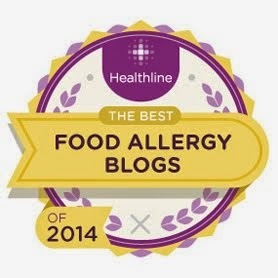 A recent trip to the Southwest to visit family, along with trips to a new and different supermarket in a completely different part of the country (I'm Chicago-based) got me thinking about the availability of peanut and tree nut allergy-friendly foods for all of us nut-free parents out there. I don't know about you, but it's not really worth it to travel to Whole Foods and use the gas money just to buy my favorite brand of nut-free trail mix that my kids love, only to discover that the store no longer even stocks it. Now for the good news: Online retailers are increasingly meeting the needs of shoppers in quest of nut-free (and other free-from) foods. Tasterie is service that has cropped up to meet the needs of food-allergic and intolerant customers. Created by a pediatrician and mother of kids with food allergies, this company sends you tailor-made boxes of allergy-friendly snacks and treats. Working with a nutritionist to keep things healthy as well as a peer board, this company takes the guesswork and legwork out of allergy-friendly shopping and the cost is surprisingly reasonable. If you are a busy parent--and who isn't--this could be a real time saver for you. Visit Tasterie's web site for more info. Amazon is another convenient resource for allergy-friendly foods and baking items. Check Amazon to see if your favorite brands are offered and order in bulk to save money and time. I like to order my holiday baking supplies via Amazon -- it's easy and the delivery time is quick. Of course, if you want certain items available at your local grocery stores, you can always ask your grocery manager to stock and/or order these items for you in bulk. You should be able to save money if you buy non-perishables in bulk. Asking your local grocery to stock certain items is a good idea because unless you ask, they won't necessarily know that these items are in demand. Customer demand brought 4 varieties of SunButter sunflower seed spread to my local grocery shelves, along with Enjoy Life Foods granola and Boom Choco Boom bars, among other items. In fact, customer demand has brought nut-free cookie company Skeeter Snacks to many store shelves including Costco. Currently, you can also find Divvies nut-free, egg-free and dairy-free treats at Wegmans and other select grocery stores. Of course, you can also order these treats online (click the links to visit their company websites) but when you can just swing by the store for your nut-free treats, that is a huge convenience. Reading grocery labels can be confusing, too, so I devoted an entire section on how to decipher food labels and deal with customer service concerns in my e-book, The New Nut-Free Mom. Click the link for more information on the e-book and how to get it. How do you find nut-free or other free-from treats and snacks? At the store? Online? What works best for you? It's that time of year again! Parents are starting to plan and/or hear about Halloween parties at school and many are concerned because once again, the kids with severe food allergies are at higher risk due to all of the food coming into classrooms. The sheer amount of candy that comes into school can make it difficult to monitor, especially if your child is very young and not doing much self-management yet. I think there is a better way to do this and that is by reducing food. Even if food is allowed, why not limit it to just a few things instead of a gazillion food items that then need to be screened. Something will always slip through the cracks if you offer an unlimited supply of food. Everyone -- kids, teachers, other parents -- want these parties to be fun and not potential ER emergencies. I wrote an article for Chicago Parent magazine awhile ago, but it is a perennial one in terms of addressing food at school parties. Plus, here is a recent blog post about going food-free for school parties. This has been one of my most popular recent posts, so I am sharing again for those who haven't seen it. Don't stress, just be prepared to offer alternatives. And it's never to early to start coaching your child NOT to eat anything until you give it the thumbs up at home. Please feel free to share my articles and posts with your school and thank you for all you do to keep Halloween parties safe, fun and inclusive!